Mind Meld With Greg Pak! From all the way back in 2004 to this very day, Greg Pak has been a man who’s made a name for himself in the world of comics. Whether it was writing for Marvel’s Incredible Hulk, the X-Men, Silver Surfer, something from DC such as Batman/Superman in 2015, or even a non Big Two book, he’s most likely written for it! Or has yet to do so for one reason or another. However, his most recent from BOOM! 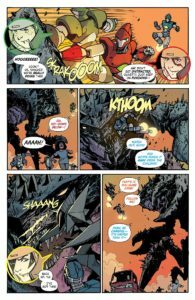 Studios, is a fun throw back to the days of Giant Robots and equally Giant Monsters that battle it out for good or ill this time around in the pages of Mech Cadet Yu! And with its 4th issue coming out on November 15th with more to come after being upgraded to an ongoing, the chance to ask him a few questions about the book was had! So if you’re ready, continue on with your reading of this latest interview! As someone who needs no introduction, let’s get right down into the fun of questions! 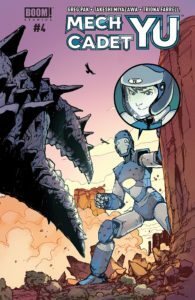 Mech Cadet Yu, a title of monsters, giant robots, Asian American Leads, and a surprise twist of our rising hero being a Janitor! What got you to basically say ‘let’s do this!’? GREG PAK: Well, it was my own story, so no one had to convince me to do it—I’ve been hungry to dive into this one for years! 😉 But actually doing it depended on finally finding the right home with BOOM! Studios, where everybody we talked to just immediately got it and loved it. It’s basically a bunch of things I love put together into one comic book series, drawn by Tak Miyazawa, one of my favorite artists on the planet. I love our giant robots from outer space. I love the way they mysteriously bond with kids, who become their pilots in the war against the monsters known as the Sharg. I love this multidimensional cast that features multiple Asian Americans of very different backgrounds. I love our underdog hero Stanford, with that chip on his shoulder and that big heart of gold. I love the fact that there’s a subtle exploration of class divisions in this militarized world, with a janitor’s kid joining the elite Sky Corps. 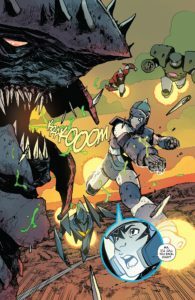 I love the incremental world-building we’re doing issue-by-issue and the way this very simple setup of kids in a giant robo academy preparing to fight giant monsters turns up more interesting shades of gray each issue. Every day I get to work on this book makes me so happy. Thanks so much to everyone who’s supporting it! One of the earliest things that I found interesting about this take on the monsters and giant robots genre is the fact that Stanford Yu’s rival for all intents and purposes is a girl. One who’s the daughter of a general at that. Which is a bit different as usually the rival is a boy. What made you and Takeshi decide to go that route with a girl instead of a boy? Though it certainly makes for a fun twist to things! GP: Great question! We actually did a preliminary 10-page story for the Shattered Asian-American comics anthology a few years back that set up the story, and in that version, Stanford’s rival, Park, was a boy. 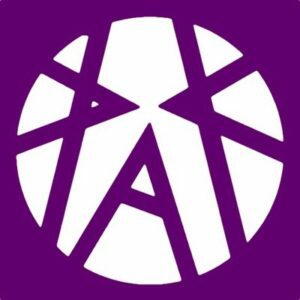 But over the years, I’ve thought a lot about the need for more roles for girls and women in all kinds of media, and I wanted to get more gender diversity in the group of kids. One of my editors suggested making Stanford’s rival a girl, since as you note, that’s not a dynamic you tend to see a lot, and I thought it sounded fantastic. As always, Tak did an amazing character design and we were off to the races! Stanford’s mom seems a bit… Stuck on her view point about hers and her son’s place in life. Would you say that’s an accurate view of her? GP: As we reveal in issue #3, Stanford’s mom, Dolly, has a pretty good reason to be worried about her son being a cadet and possibly facing the Sharg. This is a family that’s suffered and lost a lot, so it makes good emotional sense for her to be protective of her boy. I love writing Dolly. She’s tough as hell, but she loves her son so much. I think a huge amount of the emotional impact of the book comes from the struggles we know she’s been through and her desire to protect her son, even as he’s determined to step up and help others. Speaking of the general we get to meet early on, anything you can tell us readers about how long of a pain in the rear you and Takeshi intends for him to be? GP: Oh, we’ve got a big plan for the General, who also happens to be Park’s father. Small spoiler: In our first issue, Stanford bonds with the robo that Park thought she was supposed to get. So, the General hooks Park up with the world’s first man-made giant robo, who seems to have a much greater potential for danger than the other robos. So, the General may be even shadier than he first appears—but you’ll have to keep reading to find out! Despite the hang ups Buddy seems to have, especially in how it caused him and Stanford to meet. It’s certainly safe to say that there is more to him than meets the eye? GP: All the robos in the story are sentient creatures with reason and emotion. Stanford’s robo Buddy will learn and grow throughout the story, just as Stanford will. Will readers, depending on how long you and Takeshi do the series, learn how and why the robots started coming to Earth to begin with to defend it from the evil Sharg? GP: The series was upgraded from a four-issue mini to an ongoing, which will definitely allow us to dig a lot deeper and uncover more of this central mystery. But yeah, how much we’ll reveal depends on how long the series continues, so please do keep buying and spread the word to your friends! Also, I’d love to send out HUGE thanks to all the readers, retailers, and reviewers who have been plugging this book hard from the beginning. Because you bought this book and got so many other people excited about it, we’re getting to tell more stories, and we love you so much for it! 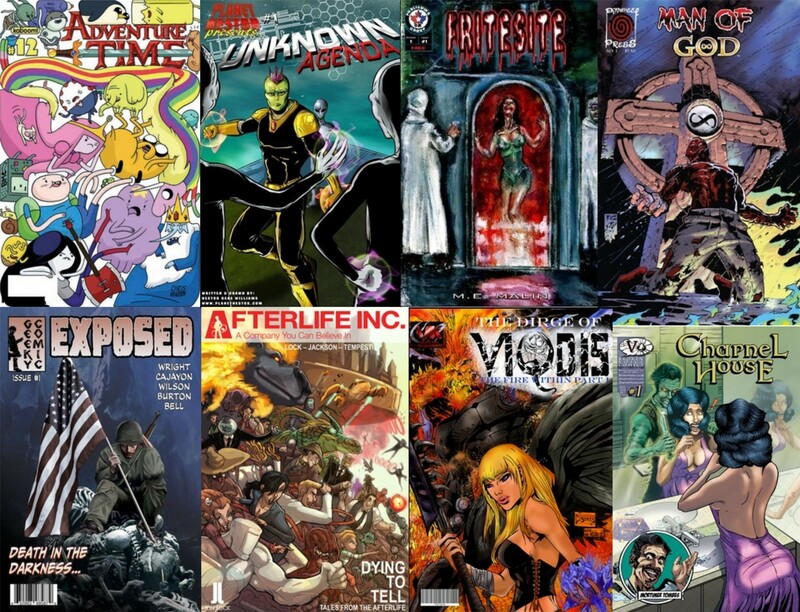 Editor’s Note: Many many thanks to Greg for taking part in this interview! And remember folks, November 15th brings on the 4th issue of Mech Cadet Yu! Tags: BOOM! 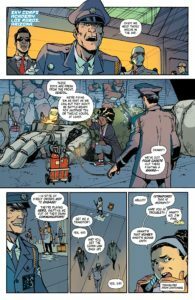 Studios, Dolly Yu, Elite Sky Corps, Greg Pak, Incredible Hulk, Indies, Interviews, Mech Cadet Yu #4, Mind Meld With Greg Pak!, Shady Generals!? 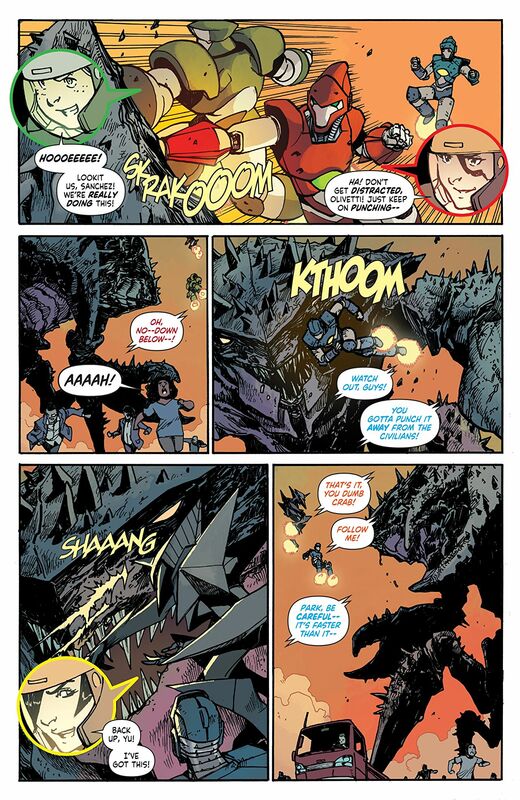 Say it ain't so!, Small Press Love, Standford Yu: Loving Son and Janitor but also a rising hero with his Mech known as Buddy!, Takeshi Miyazawa, Them Sharg just aren't any good!, Yu vs. Park in a not so classic way!